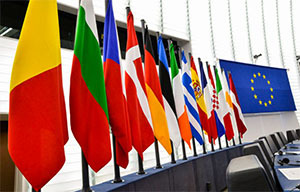 On 27 March, ADEMU attended the European Parliament in Brussels to present its preliminary research findings at an internal seminar at the Directorate‑General for Economic and Financial Affairs (DG-ECFIN), followed by a public session in the premises of the European Parliament. DG-ECFIN is responsible for EU policies promoting economic growth, higher employment, stable public finances and financial stability, all of which have been the focus of ADEMU research. ADEMU scientific co-ordinator Ramon Marimon joined Marco Buti, director general of DG-ECFIN, Roberto Gualtieri, MEP and chair of the Committee on Economic and Monetary Affairs at the European Parliament, Maria Kayamanidou, deputy head of DG Research and Innovation at the EC, and Vincenzo Grassi, secretary general of the European University Institute, to discuss ADEMU’s proposals for the European Unemployment Insurance System (EUIS) and the European Stability Fund (ESF). ADEMU professors Arpad Abraham and Giorgio Monti and PhD Researchers João Brogueira and Luas Mayr, all from the EUI, also participated. Vincenzo Grassi welcomed the speakers and participants to the event, which was co-ordinated by the EUI as a pre-cursor to Ademu’s final conference on 9 and 10 May in Florence. Ramon Marimon briefly explained the objectives and consortium of ADEMU and focused on the need to ‘strengthen the resilience of the EU’, in particular of guaranteeing that better stabilisation and risk-sharing policies and institutions will be established. You can see Professor Marimon’s full presentation here. Marco Buti commented that ADEMU’s research and policy proposals dealt with the issues currently being discussed by the EC and other EU institutions, and refer to the EC proposal on the need to establish a stability function, as proposed by the EC in December 2017. Concluding the presentations, Roberto Gualtieri welcomed ADEMU’s work and noted that a proposal for a European unemployment insurance system will soon be discussed in the Committee of Economic and Monetary Affairs of the EP. He also stressed the need to further strengthen the EU economic stabilisation capacity. A question and answer session at the well-attended seminar followed the presentations, lasting well over an hour. This entry was posted in Event reviews, News on April 6, 2018 by ADEMU.